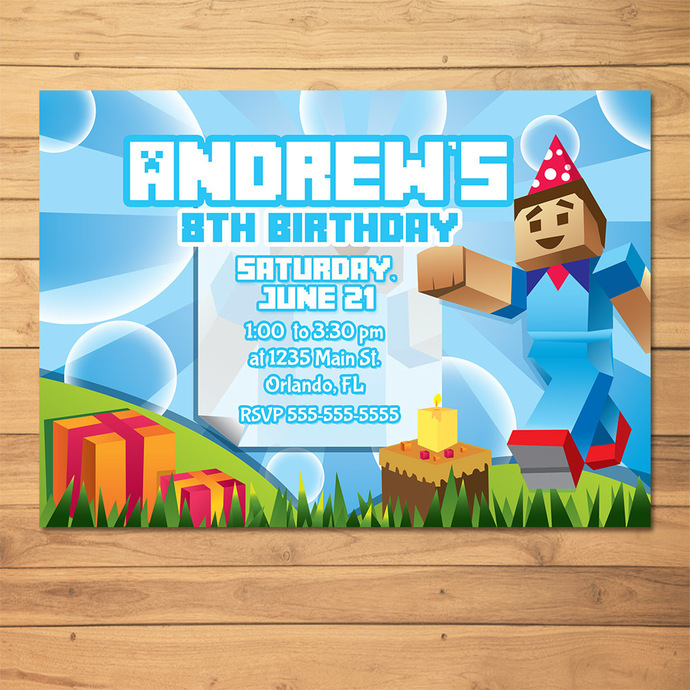 Free, Hi-Res Minecraft Party Printables available for instant download. 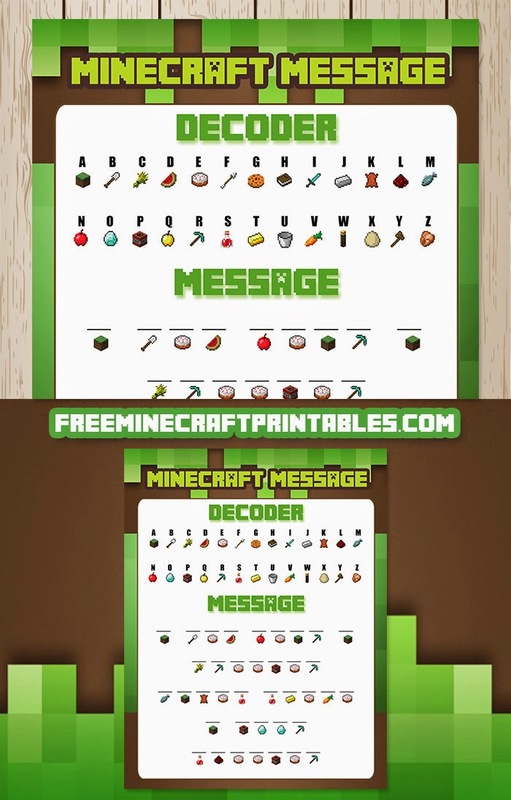 Bypass the Etsy madness and get your Minecraft Printables here for your next party. 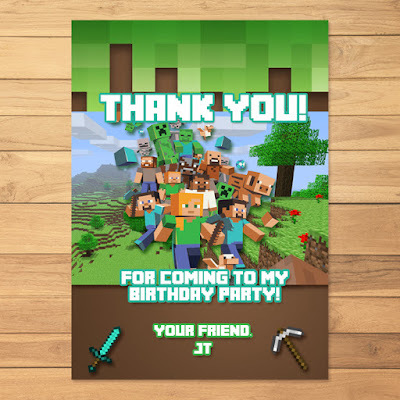 This Minecraft Invitation and Minecraft Thank You Card are a great way to get the word out about your Minecraft Party. We will personalize your Minecraft Invitation to your specific needs. Please note that this is a Printable/Digital Product. No physical item with be shipped to you. To process your order, we need the following information so be sure to put this info in the form box when you purchase or there could be a delay in your order. * Any other important party details you'd like your guests to know. Once your order has been received it will be processed and then emailed to you. From there, if you have any revisions, I'll be happy to make those. Otherwise, you'll be all set to print! Thanks for looking and be sure to drop me a note if you have any additional questions. 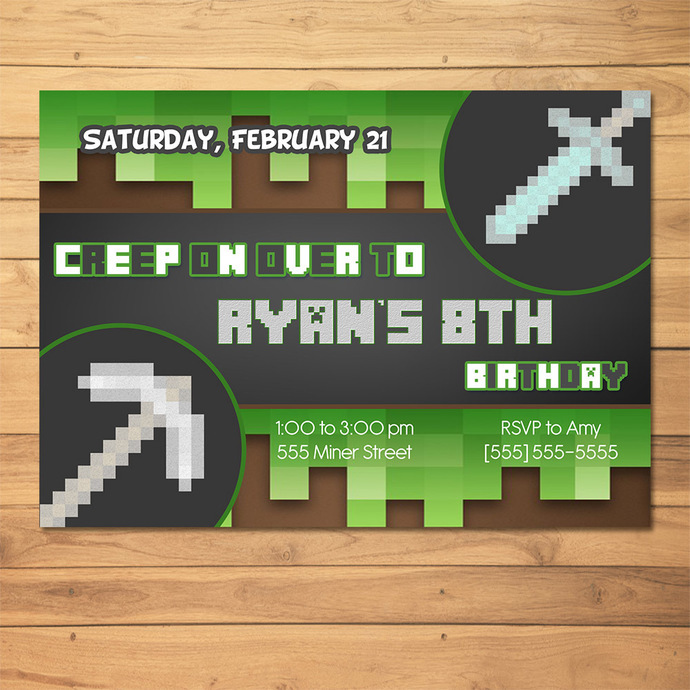 This Minecraft Invitation (Pickaxe and Sword Theme) is a great way to get the word out about your Minecraft Party. 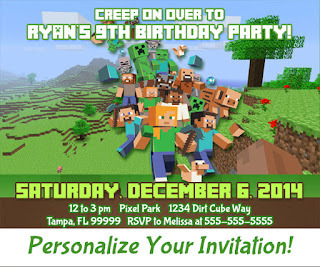 We will personalize your Minecraft Invitation to your specific needs. 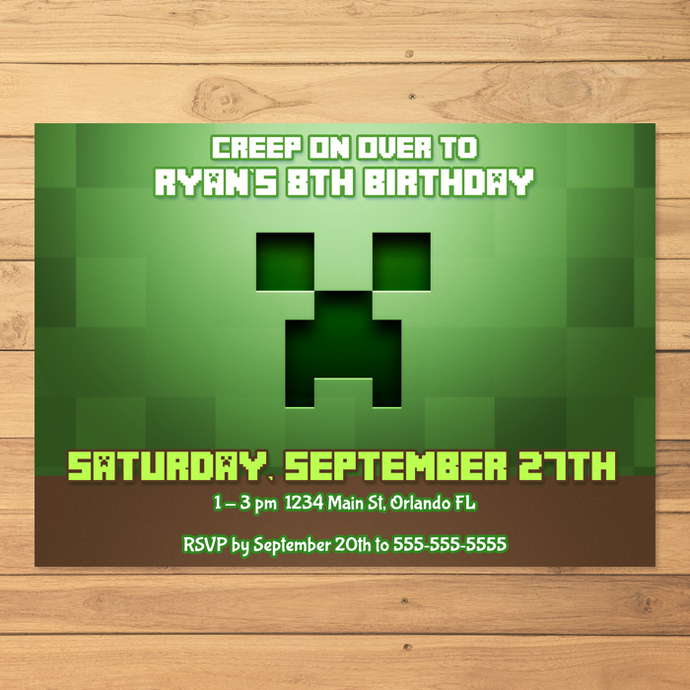 This Minecraft Invitation (Creeper Theme) is a great way to get the word out about your Minecraft Party. 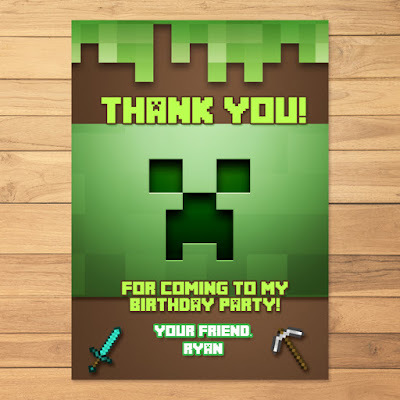 We will personalize your Minecraft Invitation and Minecraft Thank You Card to your specific needs. 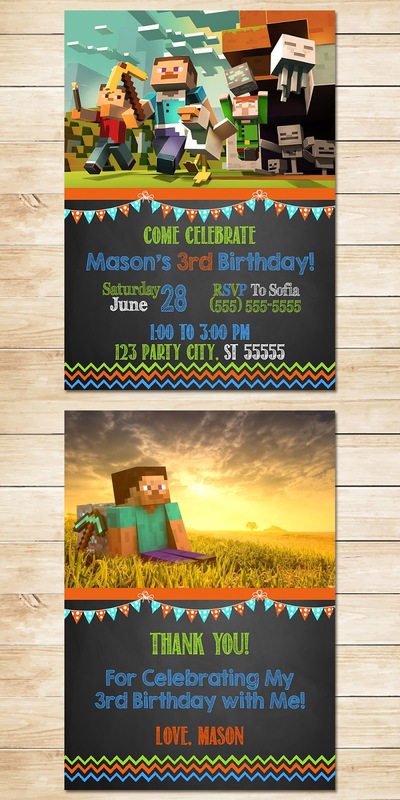 This Minecraft Invitation (Steve Theme) is a great way to get the word out about your Minecraft Party. 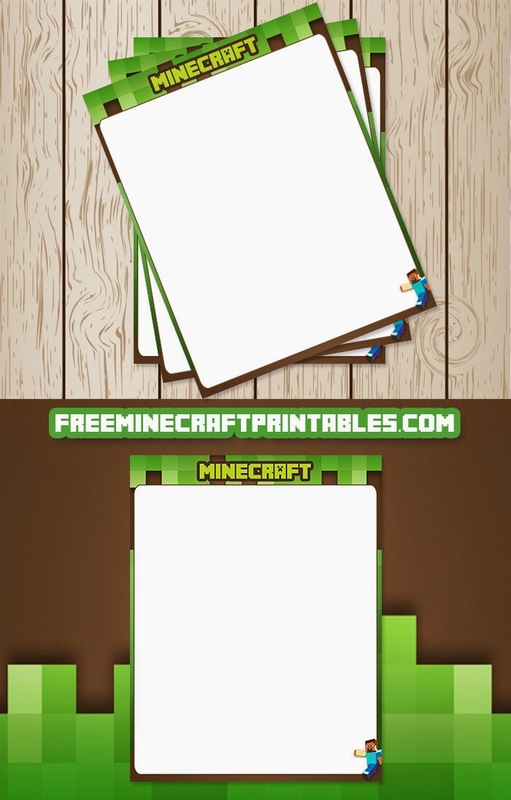 We will personalize your Minecraft Invitation and Minecraft Thank You Card to your specific needs. 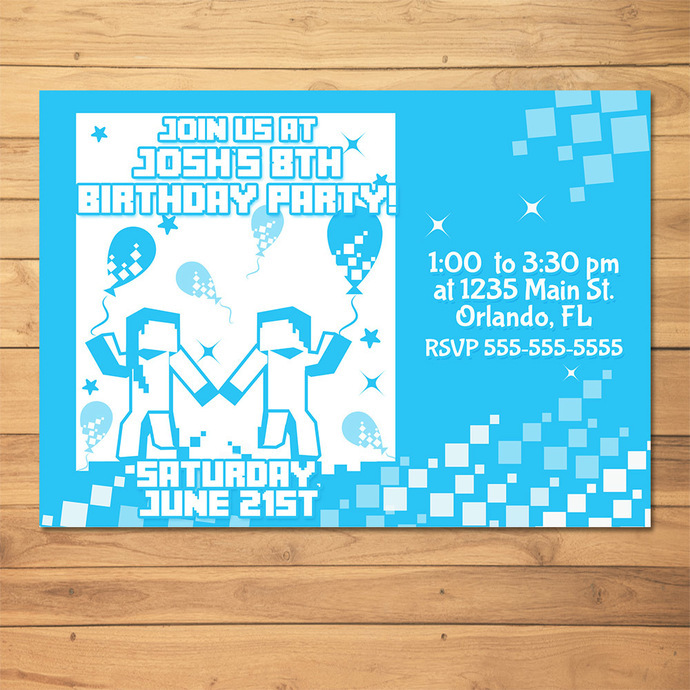 This Minecraft Invitation (Blue Dance Party Theme) is a great way to get the word out about your Minecraft Party. 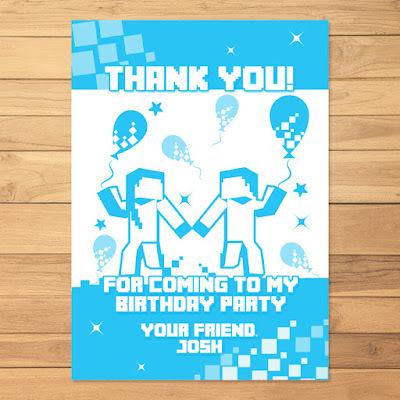 We will personalize your Minecraft Invitation and Minecraft Thank You Card to your specific needs. The size of each Minecraft Food Tent is 4.25 x 2.5 inches when folded. These also work well as small name plates or other table signs. Print the tags on card stock for best results. This file is 8.5 x 11 with 2 Minecraft food tents. 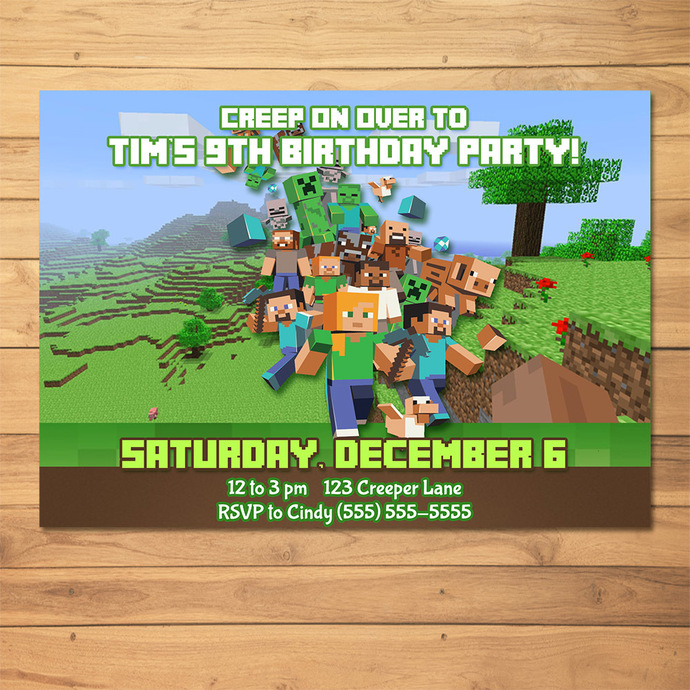 See a listing of all the free Minecraft Party Printables offered. The size of each Minecraft Water Bottle Label is 8.5 in x 2 inches. 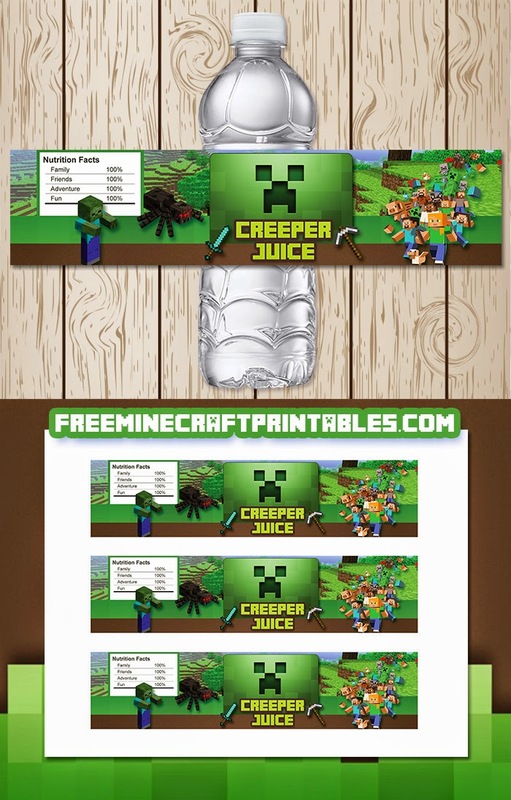 The download has 3 Minecraft water bottle labels on one 8.5 x 11 sheet. So, I'm sure this is going to come as no surprise, but my kids are just bonkers over anything Minecraft these days. My kids are three years apart, 6 and 9, so I love that Minecraft is something that can bridge the gap in interests for them. Not to mention the appeal to both boys and girls since my youngest, Sophie, loves Minecraft just as much as Cameron does. Sophie tends to focus more on the building aspect of the game. She loves to design and decorate her Minecraft house, while Cameron can't get enough of the creeper fighting adventures. Either way, I was very excited to find that we all had something to talk about at the dinner table without anyone having a pout. However, I couldn't seem to find anything at all in the stores that would help me give my two rugrats the Minecraft party they so desperately wanted... that's when I decided to design my own Minecraft party printables. I've been a graphic designer for about 15 years now, so I have all the software I needed to make these Minecraft Party Printables a reality. I decided to start this blog, Free Minecraft Printables, because I thought surely I couldn't be the only one out there that was running into the exact same problem! I've uploaded this Minecraft Water Bottle Label and they are available for anyone who wants them. Just click on that little green download button above in order to download them to your computer. I hope you all enjoy them! Feel free to leave me feedback below and let me know how you've used them! The size of each Minecraft Cupcake Topper is 2 inches in diameter. The file size is a standard 8.5 x 11 with 12 cupcake toppers ready to print! Print this on a sticker sheet, and viola, you have Minecraft Stickers to put in the goody bags. 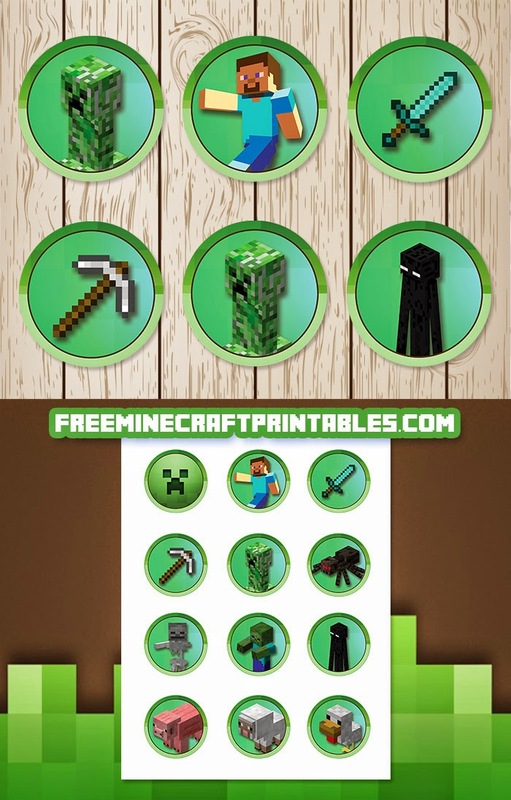 Check out our Minecraft Bottle Toppers and Minecraft Inchies for 1 inch stickers. 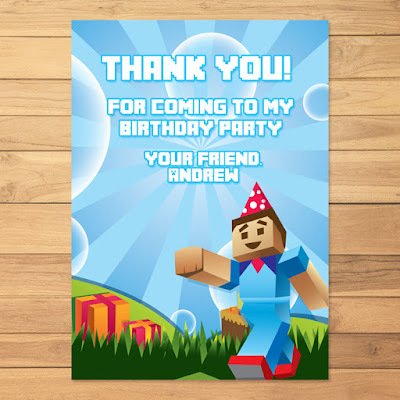 See a listing of all the Minecraft Party Printables offered. 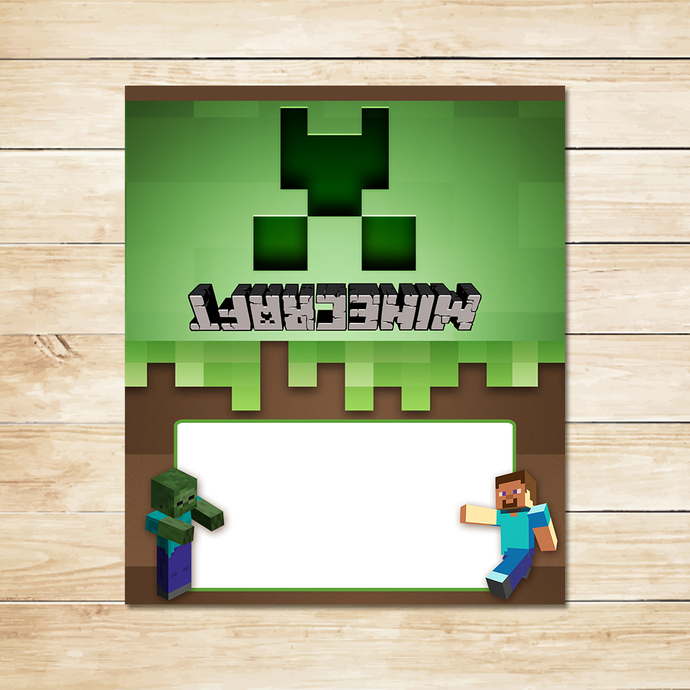 This Minecraft Banner is a High Resolution PDF, 8.5 x 11 inches in size. 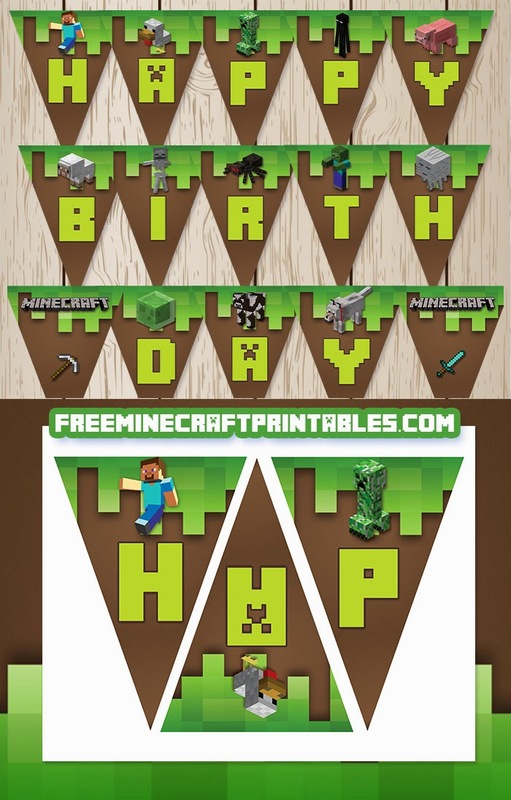 There are 5 Pages to the Minecraft Birthday Banner, and I've managed to put three banners on each page to help you save money on your printing paper! 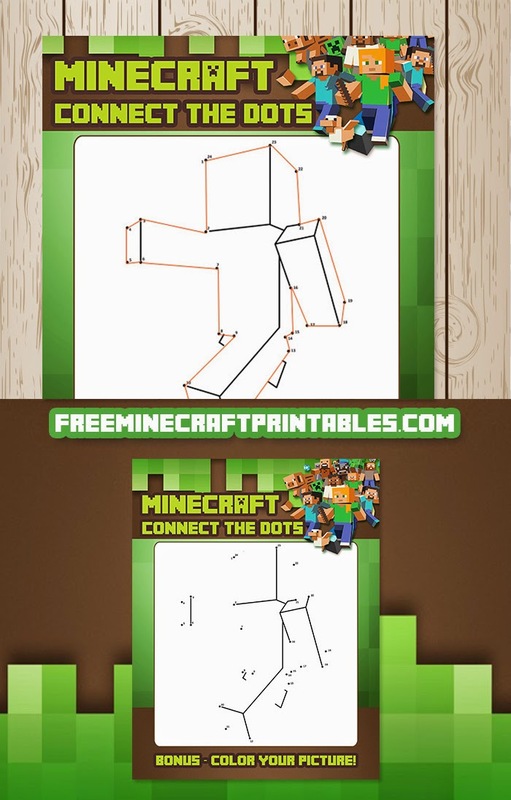 This Minecraft Dot to Dot game is 8.5 x 11 inches. This is a great activity for a party, slow summer days, a classroom activity, or home school activity. Also place in your Minecraft party bags as a fun Minecraft Party Favor. This Minecraft Reading Log is 8.5 x 11 inches. 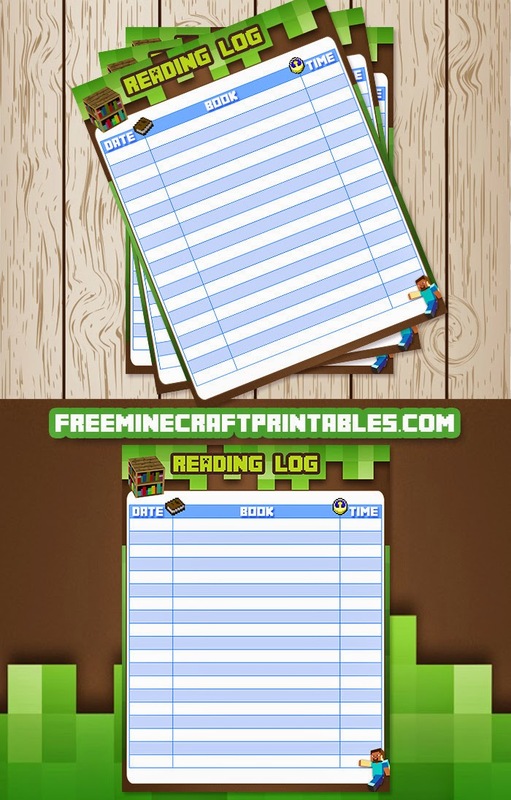 This is a great way to make the reading log fun for your Minecraft fan. 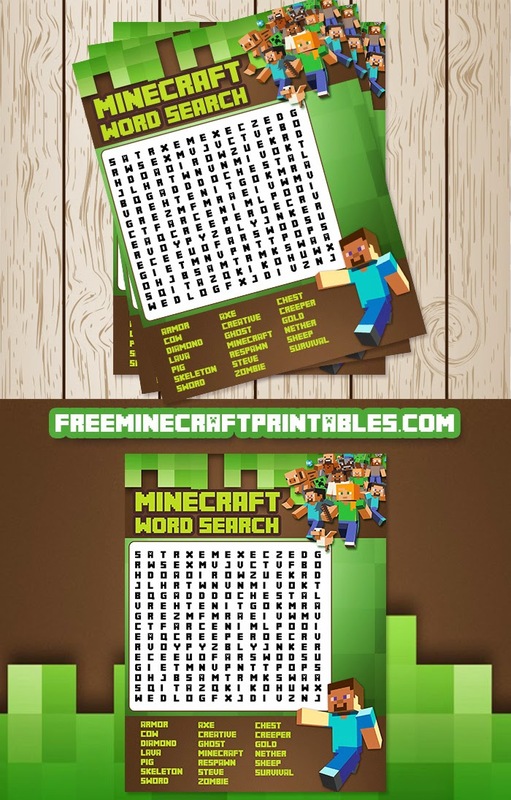 This Minecraft Word Search game is 8.5 x 11 inches. This is a great activity for a party, slow summer days, a classroom activity, or home school activity. Also place in your Minecraft party bags as a fun Minecraft Party Favor.